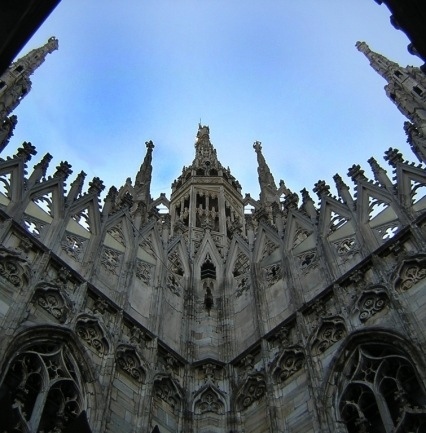 A Cathedral as enormous as Milan’s is bound to have a few mysteries hidden away somewhere. One of them can be found in the left-hand transept: a giant candlestick, known as the Candelabro Trivulzio. It is a triumph of fractal geometry: from a distance it seems just a bronze seven-armed candlestick, but as you move closer in, first of all you appreciate the size (it is 5 metres high), and then you see that the structure dissolves into a swirl of bronze leaves concealing dozens of strange figures, including animals, saints and angels. 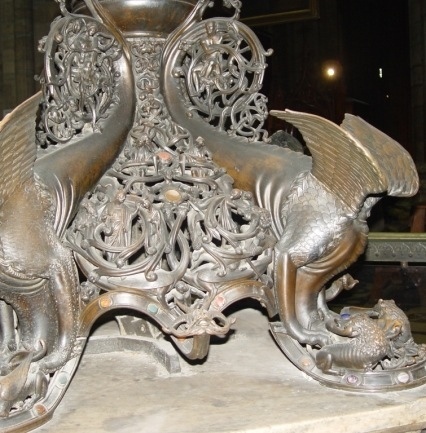 The base consists of four dragons, whose drooping heads form the feet of the candlestick, and whose powerful tails move upwards to create the basic structure. Strangely, each of the dragons is being attacked by a pair of animals. What does it all mean? Certainly the candlestick fits in very well with the Cathedral. The fluted central column echoes the great columns of the nave, and the candlestick’s organic volutes replete with Biblical characters are the bronze equivalent of the Cathedral’s decoration and statues in marble. But in actual fact the candlestick predates the Cathedral, whose construction began in 1386, by about two hundred years. And the candlestick was not made in Milan, but (according to many scholars) in England! Tracing the history of this piece of art is made more complicated by the fact that the earliest documentation is from 1550 and records Giovanni Battista Trivulzio’s gift of the candlestick to the Cathedral. It is certain that he had acquired it from somewhere in France: it is likely that it had been shipped from England to France in order to save it from the destruction of sacred images that took place during the Reformation. To give you an idea of the complexity of the subject matter portrayed in the candlestick, here is a description of a small part. As you approach the candlestick’s south side, you see a foot consisting of a dragon being attacked by two cowled monkeys wielding swords. 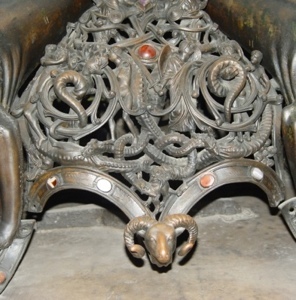 Move to the left, and at the very bottom you see the head of a fantastical animal with a curving beak and spiralling horns. Above this, to the left, there is the figure of Noah in the Ark (which looks more like a church than a boat). One of his sons is looking out from the right-hand side. Noah holds his hands in the air, having just released a dove. Further up, on the left, you can see the dove returning, with a branch of olive, bringing the message to Noah that the deluge has come to an end. To the left of the Ark, there is a flashback to before the Flood, with two sheep on their way into the vessel. To the right of Noah’s ark is Abraham, swinging a large sword and about to sacrifice his son Isaac, whom he is holding on the altar. Just above, an angel has grabbed the sword to save the boy, and just under the little altar is the unfortunate lamb who will become the sacrificial victim in Isaac’s stead. Above these two Biblical scenes are a king and a queen. They represent Virtues vanquishing the Vices, which are seen as smaller figures below. Next up comes a group of star-signs, Cancer (the crab on the left) and Leo (a lion), with Virgo sitting above and between them. In the spiralling tail of the left-hand dragon, a female figure grasps a serpent: this group embodies one of the four Liberal Arts, dialectics. Opposite, in the right-hand dragon’s tail, a young man is pouring water from a jar: this represents one of the Rivers of Paradise. They correspond to the four great earthly rivers, the Tigris, Euphrates, Ganges and the Nile. Now, leave the base and move up the central stem, past the first smooth node, to the central node. This is dedicated to Mary, who is seated on a throne, with Jesus on her lap. On the three remaining sides of this node, the three wise Kings can be seen on horseback, making their historic journey. 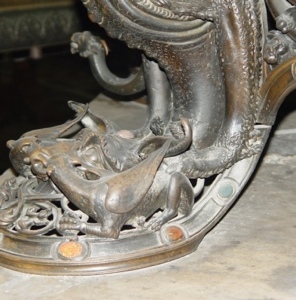 And all this is just a quarter of the candlestick: the other three sides are just as elaborately decorated. But, you may ask, what are those strange dragons all about? This is a question for which not even the scholars have an answer. It is impossible to compare the Candelabro Trivulzio with similar versions in England because, even though that country had a great tradition of giant seven-armed candlesticks, they were all destroyed in the 16th century, at the time of the dissolution of the monasteries. However, to venture a hypothesis, we could say that the base of the candlestick represents the universe, with the rivers, the history of the world with the Old Testament stories, and the stars above as symbolised by the astrological signs. From this base springs the Church, built on the figure of Jesus, which radiates light and enlightenment as demonstrated by the seven lamps. As to the form of the world itself, in 1200 it was still thought of as a flat disc supported by four elephants or other such animals. Today, a scientist would ask “and what are the elephants standing on?”, but in those days, that sort of question would get you flogged or worse. And so perhaps this candlestick’s dragons signify the continuous struggle between good and evil that characterises man’s world. 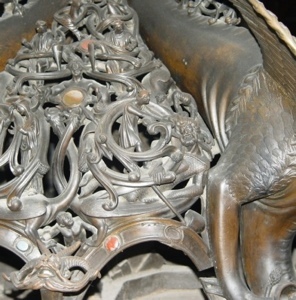 Nonetheless, this dramatic imagery has not dissuaded thieves from removing some of the semi-precious stones that adorn the bronze. In various places you will see blank sockets, and the eyes of the dragon on the east side are now bereft of the two original gems. 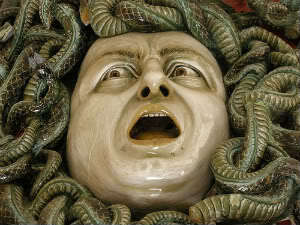 Showing that when it is a question of allaying the suffering of man, some people prefer more immediate remedies than those offered by spiritual enlightenment.